What's included in my Craic N Campers campervan? Each vehicle will have one gas bottle supplied, any additional gas required will be at the customer’s expense. Bed linen, duvets, pillows, tea towels and towels. All our vehicles are supplied with a mattress protector only. We can supply bedding kits at a cost of €25 per person appropriate to each vehicle upon request only and subject to availability. Most of our vehicles have a mix of both double and single beds. It’s usually best to ask at the time of booking what linen will be required to suit your chosen vehicle or simply bring sleeping bags! For sheets, Flat sheets work best. If bringing bicycles we advise to bring bungee cords for extra security. It is also advisable to pack all belongings in soft bags to facilitate storage within the vehicle. It always helps to be as flexible as possible with plans and be ready to embrace the adventure ahead! Do I need a special licence to drive a Craic N Campers vehicle? All our vehicles can be driven on a standard full car drivers license (B License). International drivers will require an International driver’s license if the license issued by their country of residence is not in English. How old do I need to be to drive a Craic N Campers vehicle? Drivers must be 25 years of age or over. If you are over the age of 70 years, please contact us prior to booking a medical certificate is required. Can I pick up or drop off my campervan at the airport? Upon request, we can arrange a shuttle service for you and your baggage to & from all major airports. Please contact us prior to booking for prices and availability. We conduct all vehicle demonstrations, pickups and drops offs from our depot in Roscommon Town. What time can I pick up and drop off my campervan? High season (July/August) Pick up Saturday afternoon 3pm. Drop off Saturday morning before 10am. We suggest you allow about 40 mins for pick up and 20 mins for drop off. The first driver is insured in the cost of rental, any additional drivers will be extra. 3-point seatbelt baby and booster seats can be fitted in our vehicles. We do not facilitate Iso-fix. Can I pull up and camp anywhere? Camping in areas outside of camp sites is all about using common sense. Most national parks offer area for campers to park overnight free of charge. Ireland is noted for its rural beauty and often the best way to experience this is to ‘Wild Camp’. For more information on this please visit our ‘Wild Camping’ blog here. Craic N Campers vehicles have two batteries. Both are charged as the vehicle drives. The first is isolated once the vehicle is stationary and only serves to start the engine. The second is responsible for the equipment in the habitation area. If used conservatively this can last for up to 48 hours. If this power source does become low, simply start the vehicle and it will begin to recharge again. 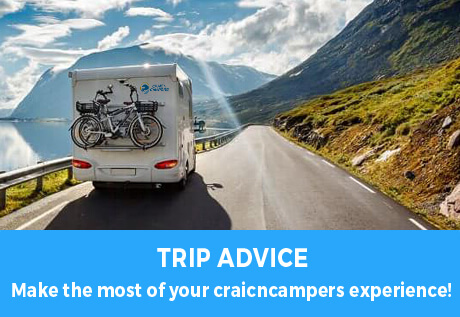 If the vehicle is plugged in to mains electricity on a campsite or elsewhere all facilities will work regardless of battery charge. Can I order food for my campervan? Yes you can. Why not order your food on www.tesco.ie and have it delivered here to our depot? We can put your food away for you in the campervan and it will be one less thing for you to think about! This is convenient and will save time!